Last we heard from CollegeBudget, its founder and CEO Mike Moradian was in the process of crowdsourcing a very personal decision — whether or not he should attend Harvard Business School or forgo an MBA in favor of leading his startup to victory (or the deadpool). After 80K votes, it turns out that, in spite of Vivek Wadhwa’s advice (and that of many others), Moradian has decided to turn down Harvard to focus on growing CollegeBudget. Sometimes a body has to follow their dreams and their passion, sorry Harvard. For some quick background, CollegeBudget set out to create a variation on the Groupon discount and group buying model, specifically targeted at campuses. The goal being to bring discounts and group buying — including for textbooks and student loans — to colleges and universities across the country. Fast forward to the present and CollegeBudget is finding validation for its campus model. Since our coverage last year, the platform has grown its user base from 600K to two million students and now features deals from over 250 merchants at more than 100 campuses. The growth, Moradian says, saw a big jump in January, when the startup launched national deals with American Apparel and Skype. The startup, which is a graduate of Y Combinator’s 2011 summer class, puts a spin on the daily deal model for food by offering discounts on specific dishes, rather than every item on the menu, a focus that restaurants love because it means they can prepare in advance for the increased demand. What’s more, focusing on specific dishes allows for quicker turnaround, a greater number of deals, which Munch On Me sweetened by taking a smaller commission on their deals than the bigs, like Groupon. Munch On Me’s unique spin on food deals (as another example, because restaurants often lack quality images of their own food, Munch On Me sends out a professional photographer to snap pics for the discounted dish) became increasingly appealing to CollegeBudget over the last few months, Moradian tells us. Especially as the startup’s competitive advantages have allowed for deeper penetration into local markets and allowed it to forge long-term merchant relationships in, it just so happens, more than 20 college towns in California. That’s what led to today’s announcement, as Moradian tells us that CollegeBudget has officially agreed to acquire Munch On Me. While the particulars of the deal aren’t being disclosed, we’ve learned that this wasn’t a pure acqui-hire, cash has indeed exchanged hands. As a result of the acquisition, the full Munch On Me team, which is currently based in San Francisco, will be staying put in the Bay Area, moving into CollegeBudget’s SF offices. “We really liked what they were up to and were keen to build that kind of functionality into our product,” the CollegeBudget founder says. After being introduced, the teams hit it off, finding that they shared a similar vision for their companies, and it wasn’t long before Munch On Me agreed to integrate their product and style into CollegeBudget. 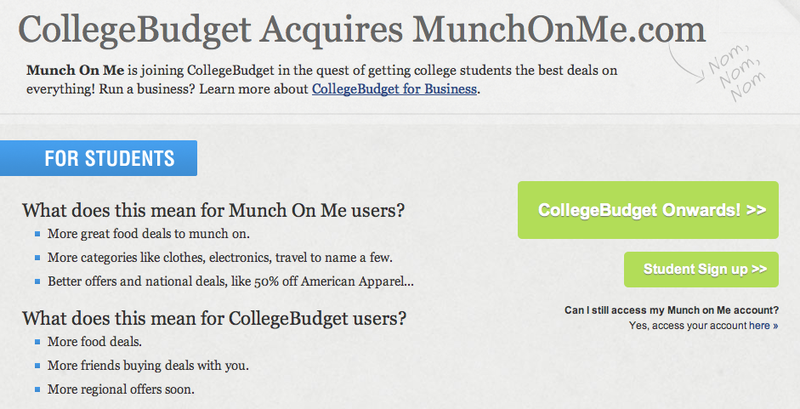 The combination of the two services, Moradian believes, will help strengthen its leadership in the college social commerce market, bringing Munch On Me’s active, food-centric user base to CollegeBudget’s growing network of college students and merchants, allowing the newly formed business to expand into new markets. The cost of the college experience (tuition and otherwise) has continued to grow, to the point of absurdity. Student debt in the U.S. today has pushed north of $1 trillion, with the average debt per student standing at more than $25,000. As a result, CollegeBudget, Moradian says, wants to do everything it can to save students on college expenses — and with Munch On Me on board, a lot of that attention will be paid to reducing food costs. As for Munch On Me users, the startup will continue to offer access to its coupons until September 1st, at which point it will officially shut down its website. You can find out more here. More from CollegeBudget on the acquisition here.